- Instead, if I were to click on the Upgrade button again, the upgrade is completed INSTANTLY. - Sandorm able to squish infantry when going under infantry. - It is no longer possible to select airborn units with box-selecting. - box selecting problem (needed to cover entire unit). Now only the center is required to select a unit. - placing units in skirmish mode in the boundaries of the map. - Dune 2 Seed map generator. Thanks to jpexs for completing the generator and making this possible! I am busy with the new sidebars; along with that I also am adding the special units. 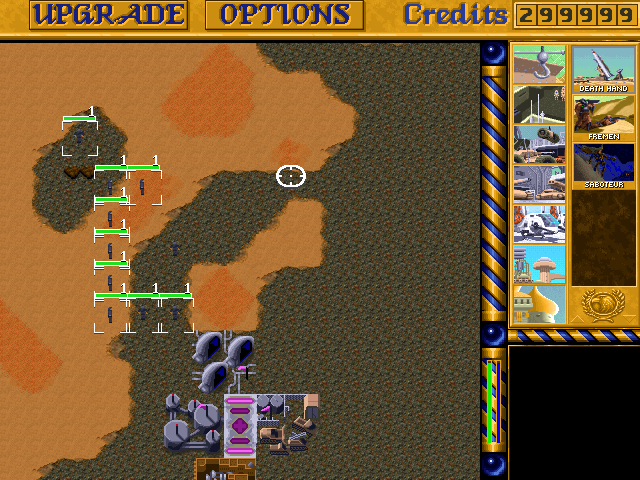 Here a screenshot of fremen (made by Nema Fakei, they are different from the original Dune 2). They are a bit strong, I need to tweak them, but that is a minor issue. Also; basically Saboteurs are also in, but they do not attack nor blow up. In the next version in skirmish mode, will you make emperor house avialable, and sandworm on/off feature? Finally when will be able to sell or destroy our own structures? I am not sure about the Emperor stuff. Because things are not that easy set up (my own mistake). Sandworm feature is more likely to make it in the next version. Something new coming up; a newly rewritten sidebar. Not much different from the outside, but totally new on the inside! Still a lot to do, but the basics are there. nice, buy the way, most of the time when you are bulding something, the sound of the credits dropping i almos never timed with the time remaning to build the item. we see and ear credits dropping but after 50% of the unit done then nothing and we just have to wait until it's done. 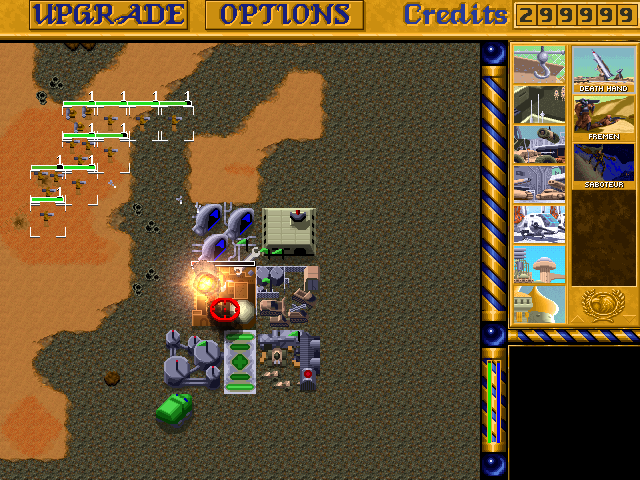 Yes, in Dune II, credits are drained as long as an item is produced - at first I even thought that the build time depended entirely on the cost, and the credits decreased at a regular speed; however, the contrary is true, as the credit drain is timed to match the build speed of each item. Atm, d2tm has 2 seperate logic regarding decreasing/increasing money and the build speed of items. This means, that an item can take X seconds to be built. But, the money drain can take twice as long. Or, the complete opposite, where the unit is still being built, but the money is already drawn. Simply said, there is no tight-coupling between the 2. I actually think that money should be decreased/increased as soon as possible so you have good impression on what your credits are. I believe, C&C, and Dune 2, take off bits of money each time. D2TM will immidiately substract the total costs of the item. This also explains, why you sometimes cannot build items while you *think* you have enough money; but simply due the slow 'drain' animation of money you cannot see your actual money is much lower. Where *credits* is the actual credits the player has, and credits_draw is the credits amount being drawn on the screen. I am not completely satisfied with this, but I am also unsure how to solve this. I've seen several approaches to this; like C&C Generals (i believe) simply substracts the amount of the item as well, but the animation is so fast that it is obvious there is no link between the build speed and the credits drain. Well, why not make it RA1-style (and RA2 style for that matter), where you don't need enough money to start building something. Once the player is out of money, the building will be paused. Basically there are two approaches, the "Westwood" approach (as described above: credits are slowly drained, and you can start production even if you don't have enough money to complete it) and the "Blizzard" approach: you can only start production if you have the money to pay the full price, and the sum is deduced from you stockpile immediately after you start to produce an item. I agree; the Westwood style is more appropiate. That would require me to rewrite parts regarding money drain. I won't be looking into that very soon, but i think this should be the way. Meaning, every 1 time unit a withdrawal of 0.25 credits. This is a 'nice' conversion. But when you get 100 time units and an amount of 900, the precision gets lost and you end up paying 899 for instance. This is actually what sometimes happens in Dune II as well. It is possible to pay less than the real price of an item and still get it complete. E.g. on numerous occasions I've been able to build a concrete slab when I only had 4 or 3 credits left. When you build something, a debt is incurred which is paid off gradually (values: debt incurred and debt paid for each transaction). At the end of the buildtime, any discrepancy between debt incurred and debt paid is sorted. You might want two 'general' counts: cash and balance, where cash is the amount drawn on screen and used to decide if you have enough money to buy and build, while balance is the amount of money you have including debts. I'm busy with the Westwood style building. Things are looking good. I've made a credits animation, along with the WW style progress / pay rules. Wow, it's looking good! Nice work. I am struggling with memory issues now. Somehow in DEBUG mode the game crashes unexpectedly. I have been refactoring the INI files loading. This was needed because I wanted to be able to specify what unit should leave from what kind of structure. Ie, in the GAME.INI file you can specify what structure produces a Trike. Would result that the trike would be spawned (even though clickable from the Quad/Trike list in the sidebar) near a HEAVYFC instead of the LIGHTFC. Anyway, that is the intention, but i am kinda stuck. i hope you can release something before august 31! Yay fixed the crash bug! And finally able to place structures again. But, the lists are not updated yet accordingly.